Benzoin (Styrax benzoin) belongs to the Styraceae plant family. It is extracted from tender, evergreen trees of 25 feet in height, where the resin collects in small incisions made in the bark. These trees are found in the rich woodland and swamps of Sumatra and around the world in places such as Thailand and Java. The hardened gum is stored in pieces, also known as ‘tears,’ or pressed into blocks. This gum is then refined further, through the method of solvent extraction, to produce a resinoid or gum, which is then used in perfumery. The two main chemical constituents of benzoin are coniferyl cinnamate, an ester, and sumaresinolic acid. Esters are said to have powerful relaxing properties on the skin, and benzoin is commonly used to calm irritation in cracked, sore, and very dry skin conditions. We use benzoin resinoid in our Curly Wurly shampoo to soothe the scalp and to give hair a glossy shine. Benzoin is best known for its sweet, balsamic, vanilla and ice cream-like essence. We use it in our American Cream solid perfume for its sweet scent and as a fixative, allowing the perfume to last on the skin. Benzoin is also used for its warming qualities, believed to stimulate blood flow and ease aching muscles. We use benzoin resinoid in our Shimmy Shimmy glitter bar, which is massaged on to relax the muscles and to give a lasting perfume. It has been used for many years as an ingredient of incense, to help reduce stress and for its antibacterial properties. We make good use of the antibacterial properties of benzoin resinoid in The Greeench and Coconut deodorant powders. Acids are very rarely found in essential oils and are said to have strong anti-inflammatory properties, which help towards soothing skin irritation and swelling. These relaxing and soothing properties have also been thought to work on the mind and emotions. Benzoin is a natural preservative and an antiseptic. Due to its resinous nature, benzoin provides a protective film on the skin and hair, which prevents it from losing moisture and gives hair shine. We use benzoin resinoid in our American Cream, Coolaulin, and Veganese hair conditioners for increased shine. 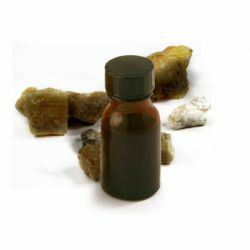 Benzoin has been used for thousands of years as a medicine for various conditions, especially on the skin, and in incense to ‘drive away’ evil spirits. It was also used through inhalation to help with respiratory problems. We use benzoin resinoid as a fixative and a natural preservative in our perfumes.